Get the most value with your Season Pass. Add these special offers and save on way more than admission! 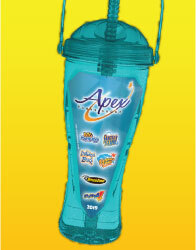 Premium Souvenir Bottle: Limit (1) per valid 2019 Season Pass Holder. Good from time of purchase to December 31, 2019. Premium Bottle fully priced at $26.99. If lost or forgotten, a replacement fee may apply. Other restrictions may apply. 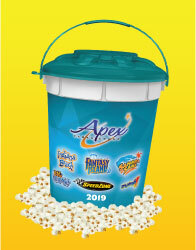 Premium Snack Bucket: Limit (1) per valid 2019 Season Pass Holder. Good from time of purchase to December 31, 2019. 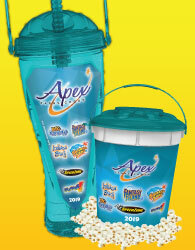 Premium Bucket fully priced at $19.99. If lost or forgotten, a replacement fee may apply. Other restrictions may apply. All Season Dining Pass: Limited time offer. All Season Dining Pass valid during normal operating hours, beginning the date of activation. Special event/buyout dates not included. Expires December 31, 2019. Must buy 2019 Season Pass to be eligible for 2019 All Season Dining Pass. Must present 2019 Season Pass ID card to redeem – All Season Dining Pass may not be transferred to or used by anyone but the designated Pass Holder. 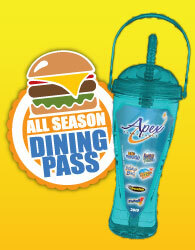 All Season Dining Pass not valid for use at any other Apex park. Pricing, menu items and locations are subject to availability and subject to change without notice. All Season Dining Pass fully priced at $109.99. Premium Souvenir Bottle must be purchased in the same transaction as All Season Dining Pass in order to receive $3 discount. Sales tax and applicable fees not included. Other restrictions may apply.